This ingress chart (a planet entering a sign) shows this coming Tuesday morning at 7:22 am, Washington, DC marks the beginning of a shocking moment. 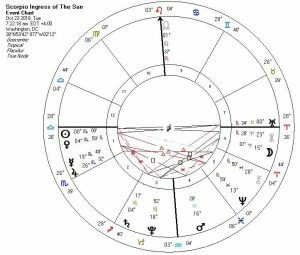 Notice the powerful Sun is not only entering Scorpio and is almost exactly opposite Uranus (in its Fall) in the sign of Taurus, but, they lie almost perfectly along the ascendant-descendant. This is extremely powerful although quite unpredictable (Uranus). You’re going to see tremendous activity with the “other countries” in the world saying, “We’ll take it from here” and declaring independence from us, that would be, the USA. Uranus puts up with things for only so long and then something has to give – well, this is that moment. Not only have many countries, organizations and personages been jerked around so much by a disingenuous “president”, but they have had enough of us wanting to “take care of #1”. I’ve been warning about this for at least 12 years, and here it is in our face. Nature takes care of itself. Liberation will be the theme and you should be very broadminded when you try to see just what has been liberated. We are being told that “The rest of the world has been taking advantage of us” but now we’re going to see the exact opposite. The Sun opposition to Uranus is so powerful and timely that I don’t even feel the need to mention the other constructs found in the attached chart. This also pertains to all kinds of revolutions within the country. Don’t be afraid – we knew all of this was coming and it needs to happen. May cooler heads prevail.